We’d love your help. Let us know what’s wrong with this preview of The Devil in the Marshalsea by Antonia Hodgson. London, 1727, and Tom Hawkins is about to fall from his heaven of card games, brothels and coffee-houses into the hell of a debtors' prison. The Marshalsea is a savage world of its own, with simple rules: those with family or friends who can lend them a little money may survive in relative comfort. Those with none will starve in squalor and disease. And those who try to esc London, 1727, and Tom Hawkins is about to fall from his heaven of card games, brothels and coffee-houses into the hell of a debtors' prison. The Marshalsea is a savage world of its own, with simple rules: those with family or friends who can lend them a little money may survive in relative comfort. Those with none will starve in squalor and disease. And those who try to escape will suffer a gruesome fate at the hands of the gaol's rutheless governor and his cronies. The trouble is, Tom Hawkins has never been good at following rules - even simple ones. And the recent grisly murder of a debtor, Captain Roberts, has brought further terror to the gaol. While the Captain's beautiful widow cries for justice, the finger of suspicion points only one way: to the sly, enigmatic figure of Samuel Fleet. Some call Fleet a devil, a man to avoid at all costs. But Tom Hawkins is sharing his cell. Soon, Tom's choice is clear: get to the truth of the murder - or be the next to die. To ask other readers questions about The Devil in the Marshalsea, please sign up. Why is this not an e-book? I read only e-books, so will have to wait I guess. There are probably other ebook formats on other sites as well. Set in a debtor's gaol in London 1727, The Devil in the Marshalsea provides for an insightful look at the harsh conditions the inhabitants had to ensure as a result of not being able to pay pitiful fines. There's an island-like mentality to the Marshalsea, as the gaol grounds separates itself from the world around it; It comprises a unique small community complete with a barber, saloon, tea house and other traders. What's interesting is that some of the souls who inhabit the Marshalsea are there Set in a debtor's gaol in London 1727, The Devil in the Marshalsea provides for an insightful look at the harsh conditions the inhabitants had to ensure as a result of not being able to pay pitiful fines. There's an island-like mentality to the Marshalsea, as the gaol grounds separates itself from the world around it; It comprises a unique small community complete with a barber, saloon, tea house and other traders. What's interesting is that some of the souls who inhabit the Marshalsea are there by choice, choosing to live among the disease, danger and squalor rather than try to return to the life that had prior to incarceration. Meticulously researched with the characters based off real life people, this book does a great job at transporting the reader to a place most would struggle to comprehend as once being an actual place. This one started a bit slowly for me but about half way it gathered momentum and then raced through to an intriguing conclusion. Set in the London debtor's prison of Marshalsea in 1727, the story follows the woes of a young man who has his entire worldly wealth stolen and ends up being arrested at the request of his creditors. The whole book takes place over only a few days but to our main character, Tom, it seems like a life time. The Marshalsea Prison did actually exist and the book has been th This one started a bit slowly for me but about half way it gathered momentum and then raced through to an intriguing conclusion. The Marshalsea Prison did actually exist and the book has been thoroughly researched. Some of the events that occur are truly horrific and the fact that they are based on real events makes them a very sad indictment on human nature. No you aren't imagining it. That is a five star rating up there. I understand it's a bit of a shock, but books like The Devil in the Marshalsea don't come along every day and even I give credit where due. Hard as it might be to believe, this one sucked me from the start. Author Antonia Hodgson hits the ground running, setting a blistering pace that kept me engaged to the final page, but momentum was far from the deciding factor in my opinion of her work. She also took full advantage of London's disreputable history, creating a chilling and deliciously authentic picture of lower class life in eighteenth-century England. The story itself is part social commentary and part good old fashioned fiction, but the deft complexity of the novel's construction make it impossible to determine where one ends and the other begins. It's layered, but in such a way that one is hardly aware of its elaborate intricacies. The heavy themes and details were balanced by an array of well-defined and distinctly original characters. These individuals were both captivating and memorable despite their questionable virtues and served as a nice counterpoint to the grit of Tom's surroundings and the heightened tension of his situation. I could gush all day, but there's really no substitute for firsthand experience. A clever tale of debauchery, villainy and corruption, The Devil in the Marshalsea isn't to be missed. Disappointing. I think that one word summarizes my experience reading The Devil in the Marshalsea. While the prose were smooth, the writing competent, and the over-all premise intriguing, the story and the characters were severely lacking. Forget the fact that I couldn't imagine the protagonist as a man...or a woman for that matter. He felt like a man written by a woman trying to sound like a man. The "character" flaws of this novel went much deeper. Not one character seemed to move beyond the s Disappointing. I think that one word summarizes my experience reading The Devil in the Marshalsea. Forget the fact that I couldn't imagine the protagonist as a man...or a woman for that matter. He felt like a man written by a woman trying to sound like a man. The "character" flaws of this novel went much deeper. Not one character seemed to move beyond the second dimension and some never made it beyond the first. Cookie cutter characters all the way and not particularly engaging or well-developed ones. Honestly, I don't need my characters (heros or villains) to be nice in order to care about them, I simply need them to have substance...to act in complex and interesting ways...kind of like real people. I did not find one character particularly engaging. The only thing pulling me forward was the mystery which was decent enough to keep me interested. Everything felt too forced...too overwritten...too choreographed. I've read fantastical and magical characters in other-wordly plots that felt more probable than those offered in this piece of historical fiction. It wasn't horrible and if you like mysteries, this might be worth your time on a rainy afternoon. It's gotten a fairly high average rating...so who knows, maybe this just wasn't a book for me. I will add that I read this while reading several other books. I often do that, as I like to read fiction and non-fiction concurrently to change it up with my mood. Maybe the fact that I was enjoying my other readings so much more made me overly critical of this one. So if that is the case...2.5 stars...tops. This actually reminded me a little of The Gods of Gotham by Lynday Faye, except where the "Gods" succeeded the "Devil" failed. Yay, I finally won a Goodreads giveaway! This fantastic novel was recommended by a GR friend who is also an author of some repute. 5 stars awarded by this lady has to be thoroughly well deserved and having now listened to the audio version I was not disappointed. In fact it's hard to believe that this is a debut novel, so expertly and beautifully written as it is. Tom Hawkins is a young man who has slipped off the straight and narrow, originally intended for the church, he has instead fallen into vices not exactly conducive to that cal This fantastic novel was recommended by a GR friend who is also an author of some repute. 5 stars awarded by this lady has to be thoroughly well deserved and having now listened to the audio version I was not disappointed. In fact it's hard to believe that this is a debut novel, so expertly and beautifully written as it is. Tom Hawkins is a young man who has slipped off the straight and narrow, originally intended for the church, he has instead fallen into vices not exactly conducive to that calling. Disowned by his Father, he is living a hand to mouth existence in the worst areas of London in the early 18th century. A well educated and intelligent young man, reasonably skilled at playing cards, and making a small living from it, he nevertheless seems to court trouble. It is this propensity which lands him in London's notorious Marshalsea debtors prison, fighting for his very life. From the day Tom arrives in the savage, poverty stricken, stinking cesspit that is Marshalsea, he is at the mercy of its ruthless and evil Governor, William Acton, a man driven by money and power, no matter how it is gained. Antonia Hodgson has introduced a rich cast of characters which I was pleased to learn were in the main, based on actual people of the time at, or attending Marshalsea on a daily basis. Because I listened to the audio version, expertly narrated by Joseph Kloska, these characters were all the more real. His range and depth of the various characters voices, and there were many, young, old, male, female, plummy accented or especially in the case of Acton, downright rough and intimidating, was superb. I had no problem distinguishing between characters, as this was all achieved in clear, expressive and coherent speech with just the right amount of inflection and depth. In particular his characterisation of the well spoken, youthful, slightly breathless voiced Tom or my favourite, his portrayal of Samuel Fleet, sly, dark and dangerous, but enigmatic. He used a slightly bored, drawling voice with just the right amount of menace to make him immediately recognisable and strangely compelling, despite the fact that he struck fear into the majority of the inmates of the Marshalsea. This is a murder mystery with a difference, being set almost entirely within the confines of an eighteenth century debtors' prison. Our narrator, Tom Hawkins, is a young man who has rebelled against his clergyman father's plans for his future and is enjoying himself in London, spending all his money on drinking and gambling. After a big win at the card tables one night, Tom is attacked on his way home and his winnings are stolen, leaving him unable to pay his debts. Taken to the notorious Marsha This is a murder mystery with a difference, being set almost entirely within the confines of an eighteenth century debtors' prison. Our narrator, Tom Hawkins, is a young man who has rebelled against his clergyman father's plans for his future and is enjoying himself in London, spending all his money on drinking and gambling. After a big win at the card tables one night, Tom is attacked on his way home and his winnings are stolen, leaving him unable to pay his debts. Taken to the notorious Marshalsea Prison, he is horrified to discover that the last occupant of his cell, Captain Roberts, was murdered. The killer has never been caught, but Tom's new roommate, the charismatic and mysterious Samuel Fleet, is the man most people believe to be the murderer. The Marshalea is privately run for profit, so it's not surprising that the prison governors want the killer identified as quickly as possible to avoid any further scandal. Told that his only chance of being released depends on whether or not he can solve the mystery of Roberts' death, Tom agrees to investigate. Unsure who can be trusted and beginning to wonder whether such things as truth and justice even exist in a place as corrupt as the Marshalsea, Tom eventually uncovers a web of betrayal and deception on a scale he could never have imagined. Other authors have written about the Marshalsea, most famously Charles Dickens in Little Dorrit, but Dickens' Marshalsea was a newer building on a site further down the road; set in 1727, Antonia Hodgson's novel refers to the original prison. Not knowing anything at all about the Marshalsea, this was quite an eye-opening book for me. I was aware that prisoners were often able to offer bribes in return for better living conditions and privileges, but I hadn't realised there was such a great disparity between the fate of those who could afford to pay and those who couldn't. The prison was divided into two sections. The prisoners who had some money to spend or who had influential friends, lived on the Master's Side, which was almost like a complete town in itself, with coffee houses, bars, restaurants and even a barber. They had the freedom to move around and in some cases were even given permission to go out into London during the day. For the poor people on the Common Side, things were much worse. Crammed into tiny cells and suffering from starvation, disease and overcrowding, they died at a rate of up to twelve a day. Tom Hawkins, whose best friend happens to work for Sir Philip Meadows, Knight Marshal of the Marshalsea, is lucky enough to find himself on the Master's Side but with the knowledge that if his luck should run out, he could find himself thrown into the Common Side to meet his death with the others. This is not a book for the faint-hearted as there are some horrible descriptions of sickness, torture and brutality, not to mention the dirty, squalid conditions the unfortunate inmates of the Common Side were forced to endure. Knowing that this was an experience many people really did have to go through makes it even more horrific. 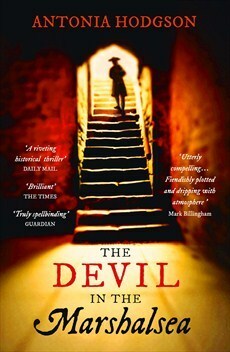 Despite this, I found The Devil in the Marshalsea very entertaining and fun to read. The book is filled with larger than life characters and I was surprised to find, when I read the notes at the end of the book, that many of these people really existed and were mentioned in the diary of John Grano, a debtor who spent a year in the prison from 1728-1729. This atmospheric , and enjoyable, debut novel is set in 1727 London. Tom Hawkins is a bit of a rake – having argued with his reverend father, he has ended up in London living by his wits and skills at gambling. When we meet him he is endeavouring to raise the money he needs to avoid a warrant out for his arrest, due to a debt of just over twenty pounds which he owes to his landlord. Having won half the money he needs on the turn of a card he is relieved and joyful and ignores the advice of his o This atmospheric , and enjoyable, debut novel is set in 1727 London. Tom Hawkins is a bit of a rake – having argued with his reverend father, he has ended up in London living by his wits and skills at gambling. When we meet him he is endeavouring to raise the money he needs to avoid a warrant out for his arrest, due to a debt of just over twenty pounds which he owes to his landlord. Having won half the money he needs on the turn of a card he is relieved and joyful and ignores the advice of his oldest friend, the Reverend Charles Buckley, to go directly home. Instead, he lingers with a pretty woman and has a drink or two, which results in his being robbed in the way back to his lodgins. Before long he is being marched through the streets to the infamous debtor’s prison, Marshalsea Gaol. His friend Charles lives with his patron, Sir Philip Meadows, who is the Knight Marshal of the Marshalsea; but there are no strings to be pulled which can extricate him from this predicament. The author has clearly done a great deal of research and we are introduced to a wonderful cast of characters. The prison is clearly a place where, ironically for a debtor’s prison, money can buy you pretty much anything – a better room, a convivial atmosphere in the Tap Room and there is even a restaurant. Everything has a price and if you can’t pay it then you are forced from the Master’s Side to the Common Side. On the Common Side, those without even enough coins to feed themselves are crammed into cells full of disease, hunger and despair. They rely on charity, but that is in short supply in a place which is based upon corruption and is ruled under the violent and vicious eye of Head Keeper William Acton. While Hawkins attempts to find his feet in this new world, he is taken under the dubious wing of the feared Samuel Fleet. His recent cell mate, Captain Roberts, was murdered and most of the prison believes Fleet to be the culprit. Meanwhile, Captain Roberts beautiful widow is haunting the prison, demanding justice. As unrest builds, Hawkins is offered a chance of redemption. If he can find out who murdered Captain Roberts, then he may escape the walls of the Marshalsea. That is, of course, if the murderer is an acceptable choice to Sir Philip Meadows – who is making an enormous profit from the prison, and the prisoners, and wants to keep it that way. This is a well written and enjoyable historical mystery. I enjoyed the setting – extremely well written and realistic – and I liked the characters. Unlike many books, the ending really was a surprise. So often you read a really good novel and the ending is a little bit of a disappointment, but this one did manage to catch me unawares. A promising debut and I do hope that Tom Hawkins is given another adventure to solve. Lastly, I received a copy of this book from NetGalley, for review. The Devil in the Marshalsea is the first in a historical crime series by Antonia Hodgson, featuring Tom Hawkins. Set in 1727 in the debtor’s prison Marshalsea in London, it is all about the hunt for a killer! Imagine owing money to creditors and falling on hard times. In 1727, you would be sent to a debtor’s prison, which could possibly be the death of you. Debtor’s prisons were run for profit and prisoners were expected to pay for meals and accommodation. They were forced to negotiate their debt The Devil in the Marshalsea is the first in a historical crime series by Antonia Hodgson, featuring Tom Hawkins. Set in 1727 in the debtor’s prison Marshalsea in London, it is all about the hunt for a killer! Imagine owing money to creditors and falling on hard times. In 1727, you would be sent to a debtor’s prison, which could possibly be the death of you. Debtor’s prisons were run for profit and prisoners were expected to pay for meals and accommodation. They were forced to negotiate their debts and treated as criminals. Social hierarchies were very much in existence, with rooms for the ‘masters’ who could pay and the ‘common’ cattle class for those who could not. Death and torture were a part of life. Into this setting, comes Tom Hawkins. Hawkins is your eighteenth century lad; a bloke into women, booze and gambling. His only means of escape from this hellish place is to solve a murder. A man is said to be haunting the place, the ghost of Captain Roberts. Roberts was murdered and his room mate is the prime suspect. Hawkins is soon risking his life, in a place where danger is round every corner and it is impossible to know who to trust. Based on what actually took place in the Marshalsea Debtor’s Prison, Hodgson takes us on a marvellous and terrifying journey. Hodgson creates this amazing world, where you can imagine the depravity and insanitary conditions. Tom Hawkins must use all of his cunning, leave his naivety behind and see beneath the grime and the deception. There is something about him, that charms and captivates. At heart, he is a good man. He suffers and he cares. This is a mystery, with a prison full of suspects and the clock ticking. A very decent book. I did enjoy it, although the climatic points fell a tad flat. A good read and love the historical context. Winter feels like the perfect time to read fiction set in 18th Century London -- it was a world of dark and discomfort and this season with no light makes it a tiny bit easier to channel that lost world. It does help that as I read about muck, disease, death, rot, and brutal violence that I am sitting in my centrally heated house with enough to eat, though, thankfully, far less to drink (alcohol and coffee being the primary options on offer). Antonia Hodgson's debut catches the flavor of the era Winter feels like the perfect time to read fiction set in 18th Century London -- it was a world of dark and discomfort and this season with no light makes it a tiny bit easier to channel that lost world. It does help that as I read about muck, disease, death, rot, and brutal violence that I am sitting in my centrally heated house with enough to eat, though, thankfully, far less to drink (alcohol and coffee being the primary options on offer). Antonia Hodgson's debut catches the flavor of the era and makes it abundantly clear that life in debtor's prison was to be avoided -- interesting, however, that so many of the people who ended up in the Marshalsea, if they found a way to survive and thrive decided to remain voluntarily within its walls. Tells you something about daily life at the dawn of the Enlightenment. There's a reason Hobbes called life "solitary, poor, nasty, brutish, and short." Hobbes was speaking of life in war, but then again, daily life was pretty much a war of survival for many people. Atmospheric's aside, Hodgson's narrator, Thomas Hawkins, is an appealing figure, a classic likable rogue with a solid core of decency. He's a recognizable type and if, like me, it's a type you enjoy reading, he will capture your fancy and keep you amused. He is worldly and innocent, game for a risk, but also aware of when he's tottering at the precipice of ruin. Luckily for us, he tumbles over the edge and into the Marshalsea and into the midst of a murder investigation. The prison abounds with suspects and the path to finding a solution is a clever one. I did have trouble keeping track of all of the minor male characters, turnkeys and porters and bailiffs abound. Aside from names these minor players appear and disappear to serve the plot, but don't take on enough substance to feel more than serviceable. Some of the major characters veer into the realm of cartoon villainy though based on real life figures. In the end it all works, but I'm not sure the book wouldn't have worked better with some pruning of named figures. There's a bit of romance, though I wish the character of Kitty, Thomas's lady love, had a bit more of a chance to blossom on the page. She's barely sketched though what does emerge holds promise of an interesting female character with greater agency than most women of the era ever managed. That said, I also couldn't quite believe the depth of attraction Thomas held for her, and vice versa, given that the primary action of the novel unfolds over a span of four days. A spark of serious lust I would buy, but the kind of deep connection that plays into the denouement? No. I'd somehow missed this book until I saw Antonia give a keynote address at #FoW14. I really enjoyed walking on the disreputable side of Georgian London - it was a fresh perspective in a historical novel with just the right balance of antiquated language and more modern intonation. I have to say I knew three chapters in who exactly had betrayed Hawkins so that he ended up in a debtors prison. I think that says more about my nasty, suspicious mind than it does about the author 's ability to foresh I'd somehow missed this book until I saw Antonia give a keynote address at #FoW14. I really enjoyed walking on the disreputable side of Georgian London - it was a fresh perspective in a historical novel with just the right balance of antiquated language and more modern intonation. I have to say I knew three chapters in who exactly had betrayed Hawkins so that he ended up in a debtors prison. I think that says more about my nasty, suspicious mind than it does about the author 's ability to foreshadow events without giving things away. I also guessed one of the two murders pretty close to the start of the book. The murder mystery side of things was strong enough but I wouldn't say that this was the books real strength. Its real strength lay in the exquisite and often grisly attention to detail of life inside a debtors prison. Debtors prisons in Georgian England were vastly different to the charming portrait painted by Dickens in Little Dorritt over 100 yrs later (the original Marshalsea was destroyed and rebuilt for a start). All the details were authentic and utterly horrifying. The characterization was good - Hawkins is a rather callow and thoughtless libertine. Oddly I found I'd gotten quite fond of Cross by the end of the book. Best if all no one is entirely good or bad - it's a sliding scale and accomplished very deftly. Definitely one for the history fans or those who like crime but want something a bit different. This should have gripped - it should have made me shudder - it should have done something more than it did. This needed a lot more time and better pace - more detail, more dark, more grime, more depth - in fact it needed more pages to really do justice to the period and the place. Solid - I guess, well researched - don't doubt it - but it lacked that quality that can make the dark historical novel totally immersive - and that was a bit of a shame. I'm not the biggest fan of historical fiction, nor do I revel in crime fiction, but somehow this novel drew me in and would not let go. It is well written, fast paced and yet so very detailed in its description. The text provides a vivid picture of what a debtor's jail was like and the brutality that went on there, all based on numerous sources the author has woven into the narrative for us. As a result I read the entire book in less than 24hrs, so intrigued by the mystery of it and enamoured wit I'm not the biggest fan of historical fiction, nor do I revel in crime fiction, but somehow this novel drew me in and would not let go. It is well written, fast paced and yet so very detailed in its description. The text provides a vivid picture of what a debtor's jail was like and the brutality that went on there, all based on numerous sources the author has woven into the narrative for us. As a result I read the entire book in less than 24hrs, so intrigued by the mystery of it and enamoured with the voice of Thomas Hawkins. I had my suspicions about the murderer being investigated, but was still surprised by the accomplice. I was also saddened by the loss of a fantastic character some way through, but understand the plot device it played so well. As for the end, it was well played and satisfying. I'd recommend this book to anyone, as it was a great read filled with interesting characters, fantastic description and historical detail and a very keen plot. Not only that, but it is well written and easy to read. What more can you ask for? I'm not at all sure what I thought of this. I read it quickly enough and it kept my interest. It certainly wasn't one of those books where I am constantly checking to see how many pages I have left or how long the torment must go on for before I can start something else, BUT there was something irritating about it and it's irritating me even more not knowing what. The story was tight and well researched. I was happy with the setting, characterisations and plot. It was just a little, how can I put I'm not at all sure what I thought of this. I read it quickly enough and it kept my interest. It certainly wasn't one of those books where I am constantly checking to see how many pages I have left or how long the torment must go on for before I can start something else, BUT there was something irritating about it and it's irritating me even more not knowing what. The story was tight and well researched. I was happy with the setting, characterisations and plot. It was just a little, how can I put this, sort of farcical. I couldn't take it seriously and imagined the entire cast of Blackadder dotted around. I usually try not to judge a book by its cover and, when I have and am proved wrong by the brilliance of the writing (case in point, Me Before You - Jojo Moyes), I hang my head in shame and promise never to do it again. However, I was floored again by this fantastic debut novel. To be totally honest, if I had seen this particular novel on the shelves and read the synopsis, I may not have picked it up. The synopsis and cover art do not do justice to the story within The Devil In The Marshalsea an I usually try not to judge a book by its cover and, when I have and am proved wrong by the brilliance of the writing (case in point, Me Before You - Jojo Moyes), I hang my head in shame and promise never to do it again. However, I was floored again by this fantastic debut novel. To be totally honest, if I had seen this particular novel on the shelves and read the synopsis, I may not have picked it up. The synopsis and cover art do not do justice to the story within The Devil In The Marshalsea and I'm so glad I've read it. It was picked as part of the Richard and Judy Autumn Book Club 2014 here in the UK which I always follow and is definitely one of my favourite reads off that particular list. Our main character is Tom Hawkins, a bit of a cheeky chappie who has had the good fortune to be raised as a gentleman but rebelled against his father's wishes to join the clergy and is having the time of his life in London where temptation, drink, gambling and women go hand in hand. Unfortunately for Tom, he has too much of a good time and ends up in debt up to his eyeballs. It is not long before his debtors catch up with him and he is imprisoned in the notorious Marshalsea prison until he can find a way to consolidate his money problems. Tom soon finds himself in a terrible predicament. It seems that you have to know the right people with the right cash to get any decent standard of living within the prison and while his cell-mate, Samuel Fleet assists him in some ways rumours about the enigmatic Fleet are widespread. And if you can't pay? Over to the "Common" side where prisoners are literally squashed into cells, punishment and killings are rife and due to the prevalence of disease (and other factors) bodies are stacked up in piles to be removed at some point, but the gaolers are in no hurry to carry out such a menial task. Ruling over the prison with an iron fist and a cunning mind is William Acton, the sort of man that you really don't want to get on the wrong side of. The second thread of the novel involves the murder of a in-mate called Captain Roberts, perpetuated just before Tom enters the prison and as yet, remains unsolved. But if the rumours are true, could Tom be sharing his cell with the devil? On meeting the widow of the murdered man, Tom becomes embroiled in solving the case but he must be incredibly careful about exactly where he treads, as the Marshalsea prison becomes a graveyard for many men, especially those that get a bit too close to the truth for comfort. It didn't long for me to become completely taken in by this wonderful debut novel. In fact, I couldn't quite believe that it was a debut, as the writing is so assured and accomplished. One of the most interesting parts about the story is that the Marshalsea actually existed from 1373 to 1842 and was well known for the richer and poorer sides of the prison. The poorest relied on charity for their food and drink while their richer counterparts across the fence had access to their own bar and restaurant. Starvation and torture with skullcaps and thumbscrews appeared to be the norm, in fact a parliamentary committee reported in 1729 that 300 inmates had starved to death within a three-month period, and that eight to ten were dying every 24 hours in the warmer weather. The author has obviously done her research with this novel and I was fascinated to read a work of fiction about a place that I had never heard of previously. The plot completely blew me away, as I mentioned the synopsis does not do it justice and there was one particular scene involving torture that had me on the edge of my seat like a quivering wreck. This is definitely an author to watch out for and I'm eagerly anticipating what she's going to do next. If it's anything like this novel I just know it's going to be amazing. London, 1727…on the eve of the coronation of George II. Young Tom Hawkins, refusing to follow in his father’s footsteps as a clergyman, has instead been eeking out a life as a gambler, a rake, and a chaser of women. But when he finds himself in debt he must wager big in order to keep himself outside of debtor’s prison. Surprisingly, he wins that big gamble but on the way back to his rooms, he is mugged and is thusly tossed into the “Marshalsea”. Life in debtor’s prison is just as harsh and cruel London, 1727…on the eve of the coronation of George II. Young Tom Hawkins, refusing to follow in his father’s footsteps as a clergyman, has instead been eeking out a life as a gambler, a rake, and a chaser of women. But when he finds himself in debt he must wager big in order to keep himself outside of debtor’s prison. Surprisingly, he wins that big gamble but on the way back to his rooms, he is mugged and is thusly tossed into the “Marshalsea”. Life in debtor’s prison is just as harsh and cruel as what Dickens describes. The gaol is divided into two sections. For those with enough influence with family and friends on the outside to provide enough money to keep them afloat, they can stay on the “Master’s” side and provide a cut to the overseers. For those less lucky, there is the “Commons” side where life is short and about as miserable as can be imagined. “Process must be followed Mr. Hawkins. You can’t just throw men into prison and let them rot. That would be cruel. They must have their time in court. Their case must be heard, their creditors must be called to account…Then they can rot.” Running the whole thing is a governor of sorts, and along with a myriad of innkeepers, barkeeps, brothel owners, etc. their only real interest is how much profit they can make off the misfortune of the inmates. And like in almost any prison in the world, even today, “If you wish to survive in this gaol…in this world then you must make people believe you are the most ruthless, calculating, treacherous man they know. They must believe you are capable of anything—the worst imaginable outrages. If your enemies learn that you are weak, they will destroy you. That is the way of the world.” Men die every day in the Marshalsea but when our young gambler’s roommate is murdered in the middle of the night in their locked room, all signs point to Hawkins himself as the killer. He must solve the mystery of the real killer before time runs out or he will be executed. I really enjoy these sorts of historical mystery novels. In addition to a nice murder mystery element, adventure, intrigue, and betrayal, there is a lot of good history here as well, not the least of which is how debtor’s prisons worked in the 1720s. It’s always been a strange concept for me to wrap my brain around anyway…how can you expect somebody who is in debt to be able to work themselves out of debt and gain their freedom when they are locked up? Thanks to the excellent research by the author, this novel was an eye opener for me in that regard, especially the free enterprise system that thrived within the prison walls. So much so that many of the prisoners stayed on voluntarily after they had found a way to pay off their debts, just to keep on raking in the profits. This is the first book in a series. I had already read and enjoyed the second book, The Last Confession of Thomas Hawkins so I wanted to go back and get this first one under my belt as well. While I still recommend they be read in order, either of the first two can be read as a stand-alone novel and I have heard the same of the third, which I will, in due course, pursue as well. Another different Richard and Judy choice. Loved this. Even the squalid, icky and upsetting parts. Period-wise, it's fantastically detailed and real. Set in 1720s London, I could see the prison, clothes, pubs, squalor and hopelessness. Language-wise, it felt like a contemporary novel a lot of the time (it certainly didn't read like Dickens), but this did make it an easy read. It's a brilliant setting for a murder mystery. It does follow a lot of modern conventions of the genre (multiple suspects, clues leading to each other, tangents and false leads, mysterious and shady ladies who may or may not have darker purposes) but in such a unique setting that it's for a history fan just as much as for someone who likes a good murder/thriller tale. I did get a little confused early on with so many names and characterse introduced within the prison setting, but soon managed to distinguish most of them through their speech. Tom himself is a witty and rascally young man, one you 'enjoy' exploring the prison with. There is a lot of fairly upsetting poverty and violence throughout, which might put a few people off. But nothing graphic. I loved the way the story turned and didn't guess the eventual guilty party. I did however learn a fair bit about 18th century life in London, and in the Marshalsea. And feel very grateful for the welfare support systems we have in place today! Set in 18th century Georgian London and, more specifically, in a debtor's prison called the Marshalsea, this book took me completely by surprise. While I have been reading some great historical titles of late, I'm afraid I found myself getting into a kind of reading slump. This book has definitely pulled me out. It has been awhile since I've read such an atmospheric book. As I w Wow! That's the word I will use to describe this book. An unputdownable romp into history and the world of a murderer. The setting and rich detail of this book bumped it up to three stars for me. The murder mystery itself seemed a bit of a mystery to the author at times. Anyone and everyone was a suspect at some point and it felt a little like the author herself didn't settle on the culprit until the very end of the book. The book benefits from meticulous research. Marshalsea Debtor's Prison is a horrendous place and our hero, Tom Hawkins, gets himself into all kinds of scrapes. There are plenty of colourful cha The setting and rich detail of this book bumped it up to three stars for me. The murder mystery itself seemed a bit of a mystery to the author at times. Anyone and everyone was a suspect at some point and it felt a little like the author herself didn't settle on the culprit until the very end of the book. The book benefits from meticulous research. Marshalsea Debtor's Prison is a horrendous place and our hero, Tom Hawkins, gets himself into all kinds of scrapes. There are plenty of colourful characters and Tom is likeable enough, but I grew a little tired with his lack of progress in his investigation. The final twists seemed too neat too. Fabulous. Read the other glowing reviews. I don't have anything to add, except that I bought the second one right away. I really enjoyed this - thanks so much to Wendy L for bringing it to my attention - and I'm delighted to see there's a follow up, which I'll definitely be reading. Set in the 1720s, this book shows us Hogarth's London, of Rookeries and gin shops, cut purses and coffee houses, a world where you'll do anything to survive, where morality is a very subjective matter indeed, and where life is very, very cheap. Our main protagonist Tom is a rake and a gambler, but he's rather cleverly also the moral c I really enjoyed this - thanks so much to Wendy L for bringing it to my attention - and I'm delighted to see there's a follow up, which I'll definitely be reading. Set in the 1720s, this book shows us Hogarth's London, of Rookeries and gin shops, cut purses and coffee houses, a world where you'll do anything to survive, where morality is a very subjective matter indeed, and where life is very, very cheap. Our main protagonist Tom is a rake and a gambler, but he's rather cleverly also the moral compass for this story because at heart Tom is that rare thing in this book, an honourable man. He's been living on the edge for a while, but finally his luck runs out, and he ends up in the Marshalsea debtor's prison in the Borough (of Southwark, a long shot from the trendy market place it is now). Ms Hodgson captures the atmosphere in the prison brilliantly. It's not just the conditions, the split between the two sides of the prison (the ones who can pay to upgrade and the ones who can't), but the treatment meted out to all, and above all - the smells. she doesn't shy away from the smells, and it struck me, reading this, how many people actually do when writing about this period. And it must have stank! Not for the squeamish or the faint-hearted mind you, and I wouldn't advise reading it over lunch, this book evokes the horror of life in a debtor's prison like nothing else I've read, fiction or fact. But it's not just about the Marshalsea, there's a murder at the centre of the book that Tom has to solve in order to escape. With every twist and turn, we discover more about the corruption and inner-workings of the prison, where money is all, and justice doesn't exist. We learn that the web of corruption spreads up from the prisoners through the chain of command, to the turnkeys and the trusties, to the governor, then out to the court system and ultimately to the Marshal. All benefit from the suffering. It's in their interests to keep it going. Unlike a lot of books I've read recently, this one held my attention right to the end. My only carp is with the detail of the ending, however. There's a few plot twists that come out to do with Tom and how he ended up in the prison which I thought were a bit contrived in how they were revealed, and a stretch too far in believing them. I felt that they were done to put Tom in a better light, almost, and I didn't think that was necessary. I'm not saying that the plot twists shouldn't have been there, only that they didn't have to be quite so black and white - I know, this won't make sense unless you've read it. I like a good historical thriller and this one was pretty good. The historical period this time is the early Georgians - 1727 to be precise. The central character, Tom Hawkins, is the rakish, feckless elder son of a wealthy clergyman. He was set to follow in his father's footsteps but realised that the Church was not for him. We meet Tom, having won just enough at cards to pay off his immediate debts and save himself from the bailiffs. But all goes horribly wrong - he is robbed on his way home, i I like a good historical thriller and this one was pretty good. The historical period this time is the early Georgians - 1727 to be precise. The central character, Tom Hawkins, is the rakish, feckless elder son of a wealthy clergyman. He was set to follow in his father's footsteps but realised that the Church was not for him. We meet Tom, having won just enough at cards to pay off his immediate debts and save himself from the bailiffs. But all goes horribly wrong - he is robbed on his way home, is arrested the next day and taken to the notorious Marshalsea debtors prison. Antonia Hodgson has created an authentic and atmospheric thriller that twists and turns at a fast pace. You really don't know who to trust and who to suspect. Her research into life in the 18th century gaol clearly shows. She paints a detailed picture which you can almost smell. My stomach roiled with Tom's at the descriptions of life on the Common Side and imprisonment in the Strong Room. There are some memorably grotesque characters - William Acton (who really was the corrupt and violent governor of the Marshalsea), Samuel Fleet, Tom's cell mate, Moll King the owner of the coffee house Tom frequented and Madame Migault the sinister fortune teller. I did feel that, whilst Samuel Fleet was introduced as a darkly menacing character who was feared and loathed by most of the prisoners, ultimately that didn't go far enough. I wanted to see more evidence of that. He was an interesting character who could have had further uses. I found myself using the kindle inbuilt dictionary loads as there are many words from that period of time which are now not in use. The details and language are just great, loads of research has been done by the author. Marshalsea is a small village as the rules, well, maybe there are not rules as such are different, you need to have money to survive there. Reminds me a little of the prisons in South America, and of one in particular in La Paz, Bolivia. The characters are colourful, some a little scary and the descriptions bring alive the prison and London of the era. This is a fantastic debut novel with a great ending that surprised me, I can recommend this if you enjoy historical murder mysteries. This is a mystery set in the Marshalsea – a London debtors’ prison - in 1727. Tom Hawkins is sent to Marshalsea for not paying debts. Whilst there, he has to solve the murder of another inmate. The killer is still on the loose and Tom has to work out which of the many shady characters living in the Marshalsea is involved. I did not enjoy this book at all. The writing is dull and the characters under-developed – they are either caricatures or plot-devices. I was bored throughout and didn’t care a This is a mystery set in the Marshalsea – a London debtors’ prison - in 1727. Tom Hawkins is sent to Marshalsea for not paying debts. Whilst there, he has to solve the murder of another inmate. The killer is still on the loose and Tom has to work out which of the many shady characters living in the Marshalsea is involved. I did not enjoy this book at all. The writing is dull and the characters under-developed – they are either caricatures or plot-devices. I was bored throughout and didn’t care about Tom (easily one of the most incompetent investigators in fiction) or any of the other characters. The plot felt contrived and was difficult to keep track of. By the end the ‘twists’ were coming thick and fast but many were predictable and several just outright silly (for example, how did Kitty manage to become a crack-shot whilst living in the Marshalsea?) I was speed-reading from about halfway through but despite that I still felt like it was taking me years to finish this. The book is based on real events, real people and a wealth of historical sources, a list of which is included at the end. Despite this wealth of background material, Hodgson manages to create next to no atmosphere. Much of the description focuses on the Common Side of the prison, but the repeated mentions of the horror and awfulness felt exaggerated even though some of it was based on true events (e.g. debtors being chained to corpses). I enjoy reading historical fiction but that combined with a murder mystery, meant that this is a book I would never have picked up to read had it not been a Bookclub choice. Now having finished it, I have to admit that it was better than I anticipated. The period details and setting are meticulously described and I shuddered more than once as I was transported inside the debtors prison of the C18. The novel is set over just a period of a few days that the protagonist Tom Hawkins spends in this I enjoy reading historical fiction but that combined with a murder mystery, meant that this is a book I would never have picked up to read had it not been a Bookclub choice. Now having finished it, I have to admit that it was better than I anticipated. The period details and setting are meticulously described and I shuddered more than once as I was transported inside the debtors prison of the C18. The novel is set over just a period of a few days that the protagonist Tom Hawkins spends in this infamous jail. Based on actual events, with characters drawn from real people, everything described is based on first hand accounts from publications of the era. Certainly not for the faint hearted, some of the descriptions are particularly savage. If you have the stomach for such graphic detail and enjoy a mystery then this is one for you.